Our Horseshoe Tournament has just met some new champions. 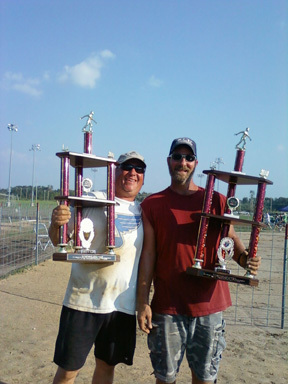 Here is Ed Fleischmann and Steve Stork proudly displaying their reward for a great job at the 30th Annual Horseshoe Tournament (2010) held at Cottleville, MO. Business meetings are held twice a month, the 2nd and 4th Tuesday, at 7:30 pm. Monthly activities: 5th Sunday Mass, Pot Luck Dinner, Pancake Breakfast, Pizza Night, etc. Annual activities include: Dinner Auction, New Years' Eve Party, Christmas Party, Religious Appreciation Dinner, Trivia Night, Night At The Races, Easter Egg Hunt. Include Church Activities, Youth Activities, Family Activities, Community Service and Council Activities. June 11 St. Louis Assembly 4th Degree Mtg. 8 p.m.
June 20 Installation Dinner 6 p.m.
June 21 Busch Stadium 4 p.m.
Ladies Aux. Council Hall, 7:30 p.m.